New! We have moved: The Toronto AnyWare Centre is now conveniently located at 36 King St E, in the heart of downtown Toronto. Learning Tree's AnyWare Centres provide a distraction-free learning environment, dual screen computers and high-speed internet. 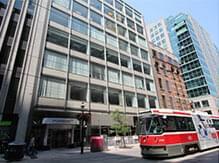 By TTC: King Station Subway stop: We are located on the northeast corner of King and Victoria.